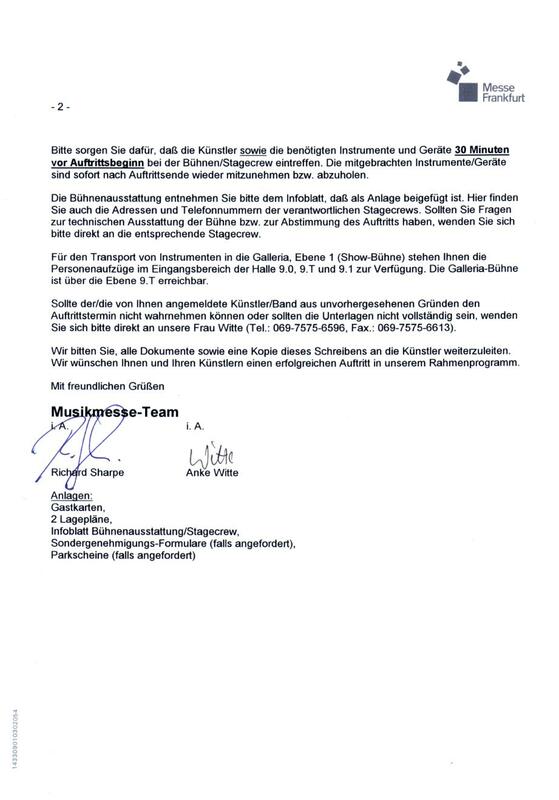 There, a person called "G.Müller" affirmed that Gallitzendörfer has exposed musical instruments for years which never did produce any sound and never were sold to anybody. 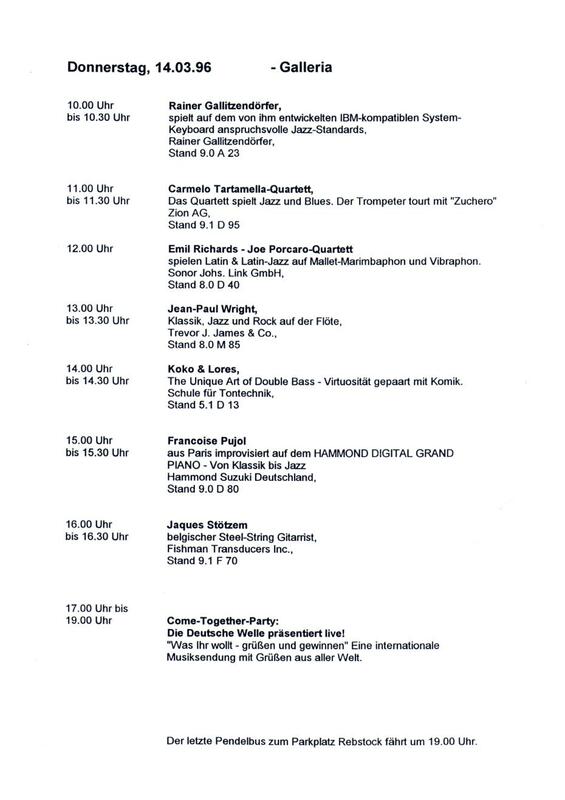 To understand this, it has to be explained how Gallitzendörfer participated on the Musikmesse Frankfurt. Gallitzendörfer had unpleasant experiences before, with the introduction of his first prototype to various companies (where the best offer (from a Japanese manufacturer) was about 50 000$, not even sufficient to finance a single international patent-). 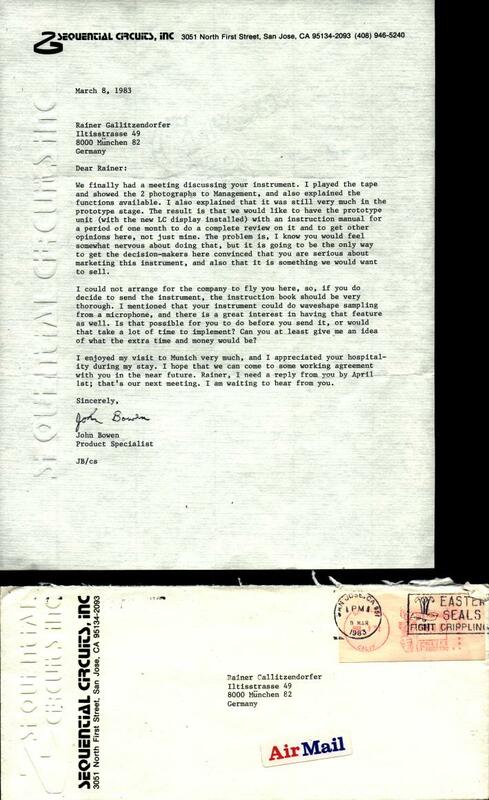 But read this letter: "Sequential Circuits Inc." - seriously - wanted Gallitzendörfer to send his prototype (a still existing synthesizer with interpolation controlled by a joystick) to them, together with an instruction manual ! (with other words: an instruction how to copy this prototype without effort - Gallitzendörfer could not believe this at the first moment...). 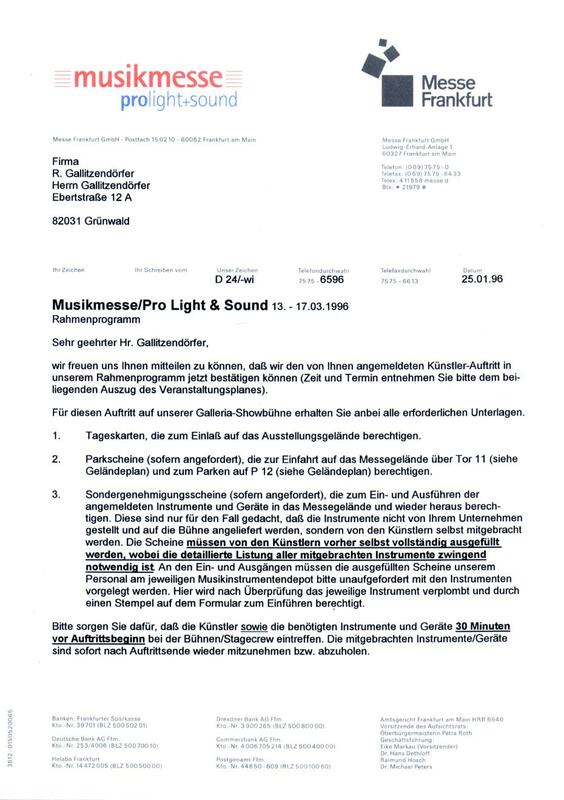 The incredible letter fom "Sequential Circuits"
The musical instrument producing company pays the local "smearer press" some considerable amount for advertising, starting with 20 000 $ (according to inofficial information, retrieved later on at the Musikmesse Frankfurt from some product managers; the upper limit is open). The "smearer press" prints "friendly" test reports about the company's products, neglecting or not even mentioning the possible more innovative companies which are not willing/able to join in this game. 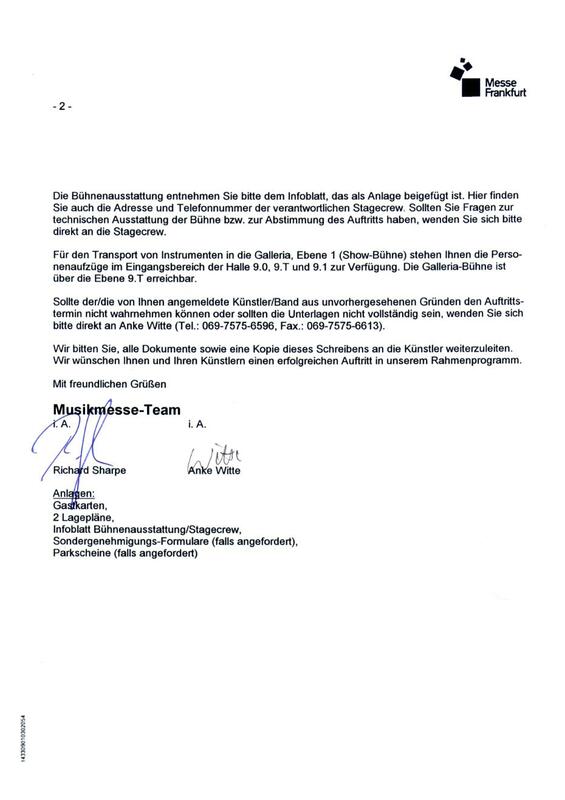 The distributors take these "reports" from the "smearer press" as a source of reference arguments to convince the uninformed end customers, thus closing the circle. Gallitzendörfer, as a highly independent, innovative and creative person, definitely was not interested in corruption, nor seemed this to be necessary for him. During the presence from 1987 until 1997 at the Musikmesse Frankfurt (Germany), he presented not less than six completely new generations of DSP systems, partially even with migration to different manufacturers and basis technologies (i.e. not only an upgrade of one and the same system over the years). 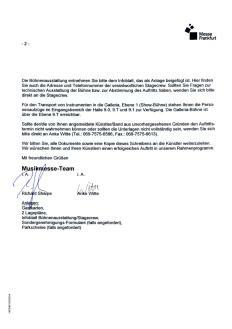 This was necessary because Gallitzendörfer intended to realize a product vision on a long term basis with these high processing requirements. This certainly was not desired by some self-complacent "local technical gurus", ensnared by the local "smearer press", always ready to hype the ones dancing to their tune. In Gallitzendörfer's case, they acted like some of the lesser intelligent bird races which tend to stick their heads into the sand as soon they are realizing a much stronger, if not incomparable, opponent. 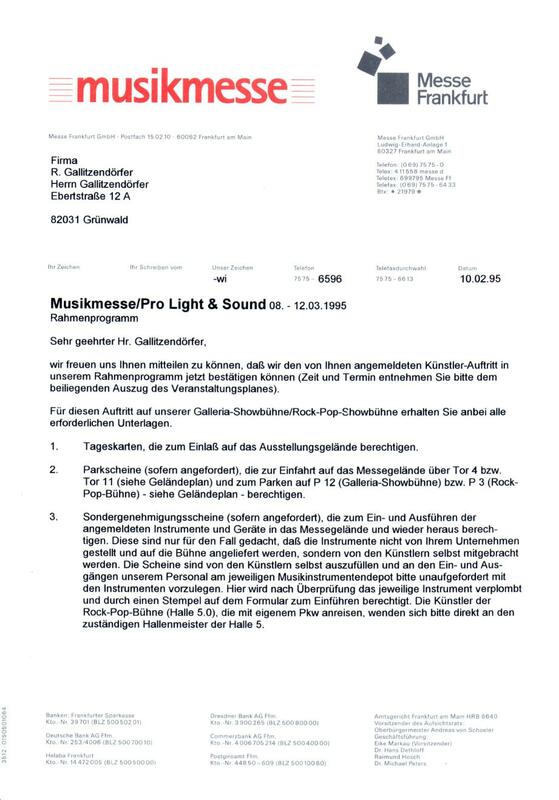 In fact, they declared for themselves, and their breed, Gallitzendörfer simply as non existent, although he made performances with his own-developed instruments for some years at the huge Musikmesse "Galleria" stage where thousands of visitors (occasional or with dedicated interest) had the chance to listen to the sounds of his musical instruments, played by himself. Already at this point it was evident that a weak but inexpensive technique (about 4,500 $) was definitely more successful for the masses than a high-quality but less affordable technology (about 15 to 30 000 $ at that time). 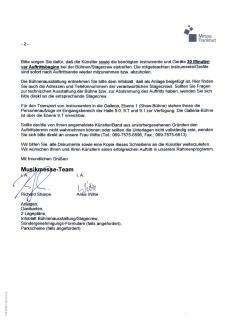 So, Gallitzendörfer's intention was for the following years to reduce the costs while retaining the high "musical" quality. But there was another point: Gallitzendörfer's unique invention of "Matrix Memory", later "Matrix Interpolation". Again, the smearer idiots confused this with a primitive existing "Midi Matrix" which has nothing common to actually calculate the sounds from bottom up, allowing only a simple blending of tones. This technology needs much more processing power than a simple playback of samples which is dominating the synthesizer technology until today (-with more memory, at least-). 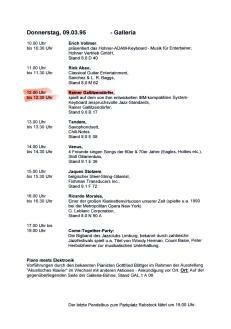 A task Gallitzendörfer is involved until today - but there are additional ingenious unpublished ideas. It can be seen from the above list that none of the leading Japanese Companies officially visited Gallitzendörfer's booth. They were, more discretely, interested listeners to Gallitzendörfer's performances at the huge "Galleria" stage at the Musikmesse Frankfurt. This stage is placed at a prominent position integrated between two halls, with a mixture of seat rows for approx. 500 listeners, and smaller booths between the halls, attracting by this way dedicated concert visitors and occasional visitors at the same time. 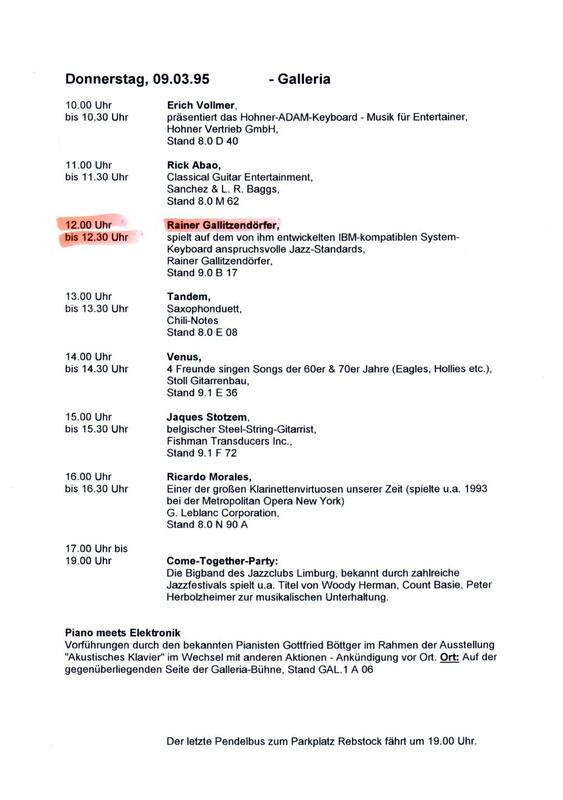 1990: The world's first musical keyboard instrument with a hi-res touch screen - a little while before the "PDAs"
In 1997, Gallitzendörfer had the occasion as one of five European companies (among them were Siemens, SGS-Thomson - and the "One Man Corporation" Gallitzendörfer, naturally) to get one of the first alpha-version chips of a new DSP generation. 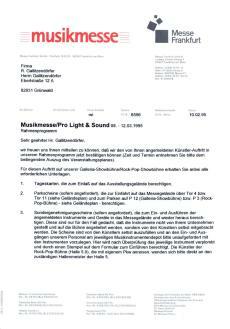 This revolutionary breakthrough encouraged Gallitzendörfer to continue his developments with the target of still more compacting his tone generating system. What occurred between 1990 and 1997 ? Most of the time, a strong annual migration stepping over six DSP hardware generations - not revolutionary for the public, but impressive for the developer. 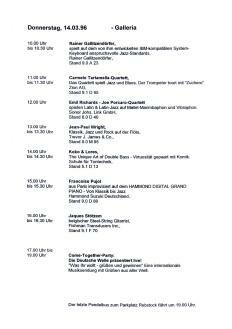 And a considerable size reduction, being one of the strong feedback influences of the Musikmesse visitors. What about selling Gallitzendörfer's products ? 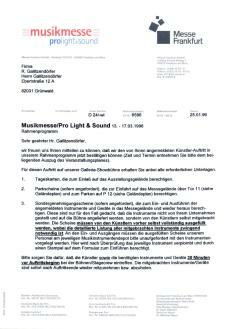 Why did Gallitzendörfer stop his annual presence at the Musikmesse Frankfurt ? Very simple - the media world had changed considerably, or, more exactly, was about to change. The real changes occurred two years later, but Gallitzendörfer knew about these changes more early (not for the first time). With these new changes (which ? - the answer is up to the reader), there simply is no more need to cope with stupid, arrogant "commercial smearers" and their associated evil, evil financier companies on a public exhibition ! They all simply are no more needed for a one-man-corporation like Gallitzendörfer's. The great possibilities of today are perfectly matched to small, flexible initiatives which do not need a large advertisement apparatus and do not have to sell large quantities of products. (c)Copyright 1997-2017 Gallitzendörfer. All rights reserved.